Our inkjet colorant product line, founded in 1996, is the market leader for aqueous pigment dispersions utilized in the desktop inkjet market. Our exceptional competency in carbon black surface modification has underpinned our success, and we continue to leverage decades of fine particle technology expertise to deliver a range of high-performance pigment dispersions. The CAB-O-JET® product line is based on a unique and proprietary stabilization technique that delivers superior print performance, stability, durability and flexibility for the inkjet ink developer, making them your first choice when high performance and ease-of-use matters. As inkjet markets evolve, so does our product portfolio. Leveraging our pigment and fine particle technology expertise enabled us to become a market-leading supplier of pigments and digital inks for commercial print applications. We use highly versatile, proprietary surface modification technology to design and manufacture a range of leading inkjet pigment colorants. After selecting the desired carbon black or organic colored pigment, our scientists and engineers apply a variety of different treatment types in order to achieve the required effect. 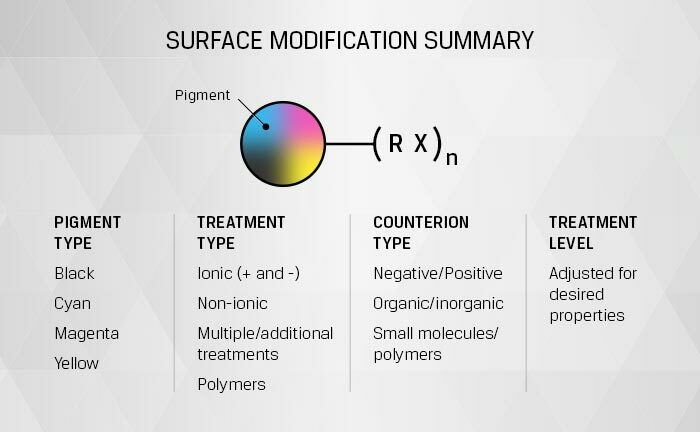 Even subtle differences in pigment constitution and formulation can have a major impact on stability, jetting and image performance, which is why our industry-leading surface modification technology is leveraged in a wide range of applications.